In a project one of the requirements was to be able to impersonate the current logged on Windows user. The problem was that when doing WindowsIdentity.GetCurrent().Name; what was being returned was the account name used as Log On as for the service. That makes sense since it is that account that is executing the service. This particular project needed to get the current logged on Windows user and check their permissions system wide, that is, check which claims the current user making use of the service has. Claims are the key component by which the outcome of all Web-based authentication and authorization requests are determined. More info on that here: The Role of Claims. This way we can assure a user belongs to a specific User Group, the user has read permission on some folder, etc. After trying some options, nothing worked. Then I decided to search for “Windows Authentication in ASP.NET Core” using Google and it lead me to this page: Configure Windows Authentication in ASP.NET Core. Since we’re not hosting the app in IIS, that was a no go. However there’s another option below that page and it’s called HTTP.sys. HTTP.sys server supports self-hosted scenarios on Windows and that was the way to go. I saw lots of people asking the same question I made prior to knowing how to handle this requirement: why are we seeing the service user returned instead of the current logged on user when doing WindowsIdentity.GetCurrent()? The answers were to the point: in Windows you can have many user sessions (Remote Desktop, etc) where all are logged on at the same time making use of the Windows Service. So, how to get the current logged on user while still making use of the service? 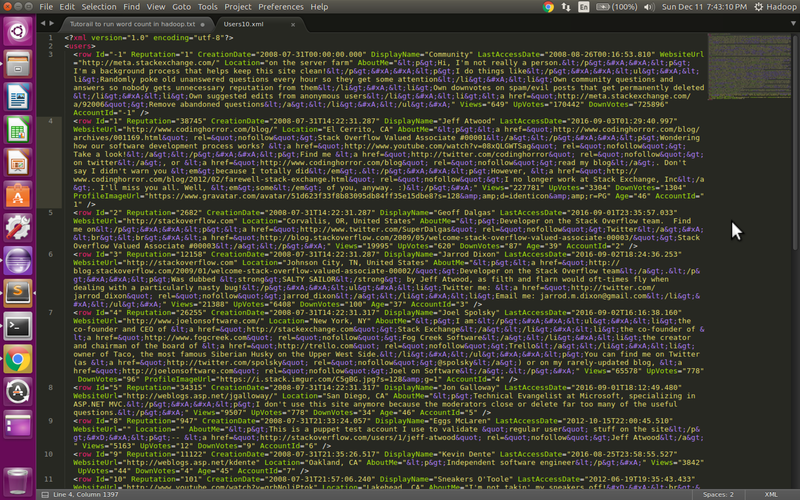 That must come from the HttpContext, that is, from the request arriving from the browser. WindowsIdentity.RunImpersonated makes it all possible. It runs the specified lambda action as the impersonated Windows identity. Just got this working and would like to share how to get it configured since I could not find an explanation anywhere. FluentEmail - All in one email sender for .NET and .NET Core is a great library to send e-mails. 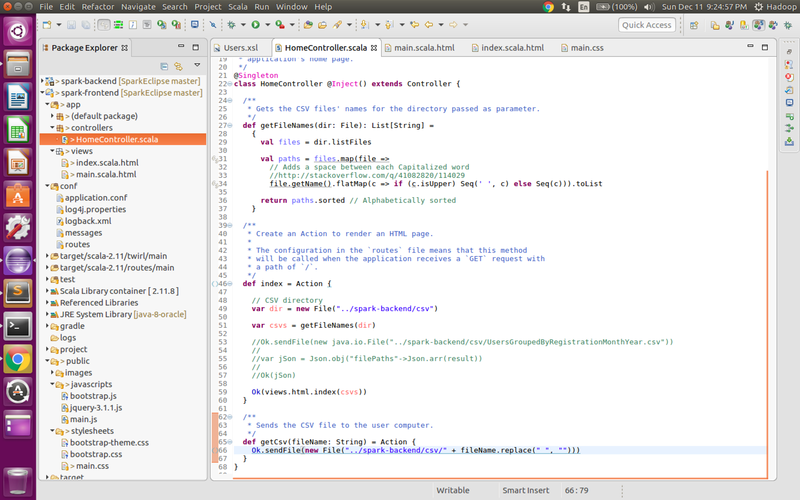 Currently I have a full .NET 4.7.2 Console Application that makes use of FluentEmail. My desire with it was to store the e-mail template (Razor .cshtml view) in an external class library and be able to use this view\template in the Console Application. It uses .NET Standard 2.0 as its Target framework. 2 - Add Microsoft.AspNetCore.Mvc.Core NuGet package to the class library. This is to have Intellisense, etc in Visual Studio. 3 - Add a Razor view called EmailTemplate.cshtml to your class library. 4 - Right click it in Solution Explorer and select Properties. In Build Action, select Embedded resource. 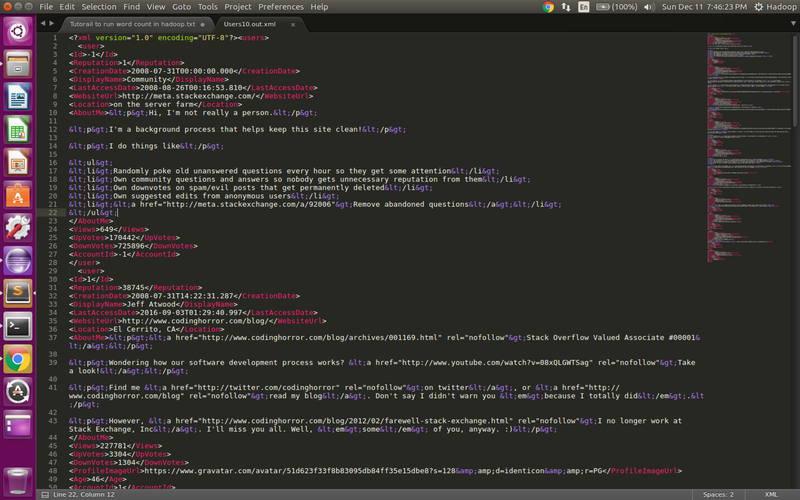 Note that I’m using dynamic in the view code. This is just for testing. You can have full blown Models and use them in the templates as well. 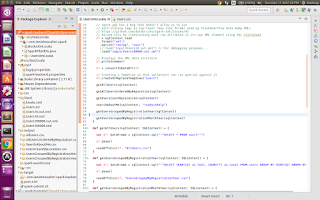 6 - In your Console Application add a reference to the Class Library created in step 1. The first parameter is the full class library (DLL) name + dot + Razor view name with .cshtml extension. The second parameter is the anonymous type that will be passed as the Model to the view and the third parameter is the class library assembly itself. This gives you a lot of flexibility. You can add images, customize the HTML, CSS, have Layout pages, etc. I had some C# code ready but needed to use it inside a PowerShell script. As we see in the code above, the variable $csharpSource holds the C# source code that later will called in the PowerShell script. We then add\mix the C# code to\with PowerShell with the command Add-Type passing to it the $csharpSource variable that holds the source code. Simple as that. This is pretty useful because we don't need to convert our C# code to PowerShell idiom. How to convert C# code to a PowerShell Script? This post is about the final work I did for one of the disciplines of the Master's degree I'm currently attending at UFRJ - Federal University of Rio de Janeiro in the branch of Data and Knowledge Engineering (Databases) that is under the division of Computer and Systems Engineering department at COPPE\UFRJ. The discipline is called Special Topics in Databases IV and is taught by professor Alexandre Bento de Assis Lima. The presentation (PPT slides) is in Brazilian Portuguese. I'll translate the slides to English in this blog post. They give an overall view about the work done. The final paper is written in English. Abstract. This paper describes the process involved in building an ETL tool based on Apache Spark. It imports XML data from Stack Overflow data dump. 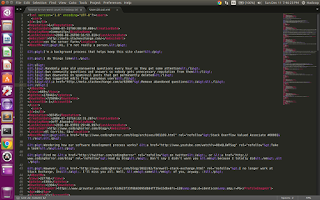 The XML files are processed using Spark XML library and converted to a DataFrame object. 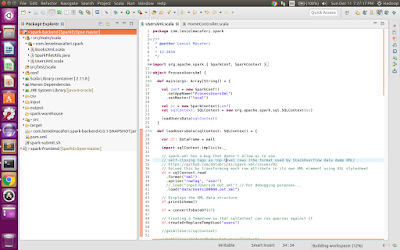 The DataFrame data is then queried with Spark SQL library. 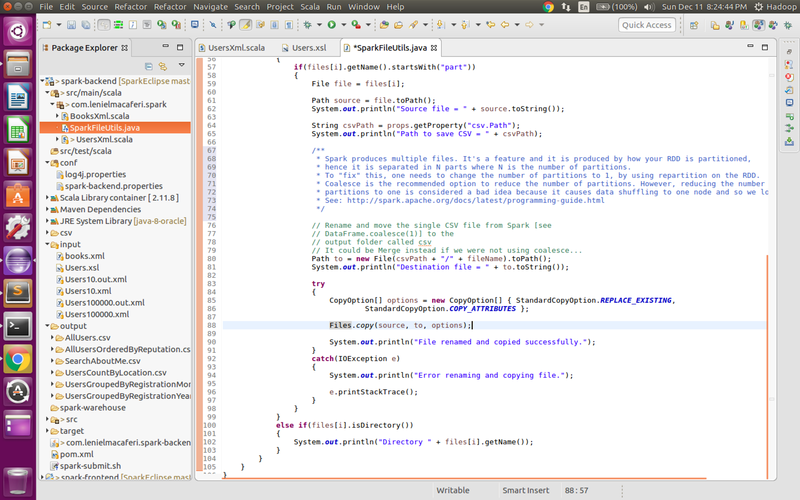 Two applications were developed: spark-backend and spark-frontend. The first one contains the code responsible for dealing with Spark while the later one is user centric allowing the users to consume the data processed by Spark. All the code developed is in English and should be easy to read. Put into practice the concepts presented during the classes. Have a closer contact with modern technologies used to process Big Data. Automate the Extraction\Mining of valuable\interesting information hidden in the immensity of data. 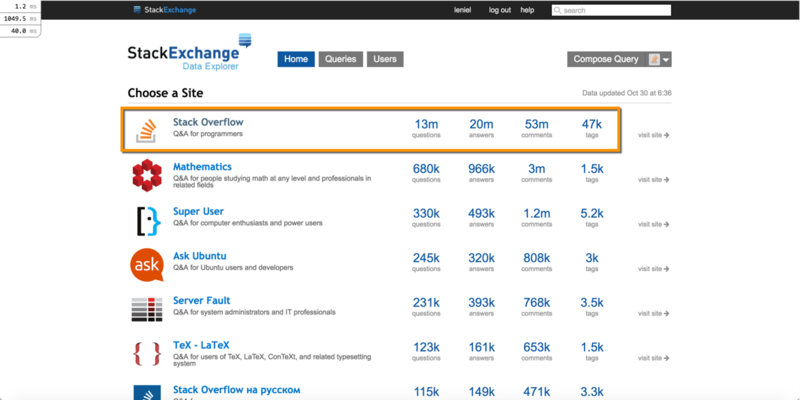 Analyse StackOverflow data dump available on the internet on a monthly basis. 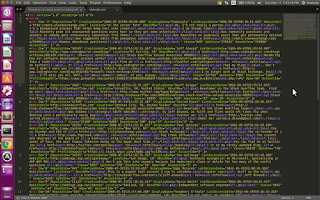 The data dump is composed of a set of XML files compacted with the .7z extension. 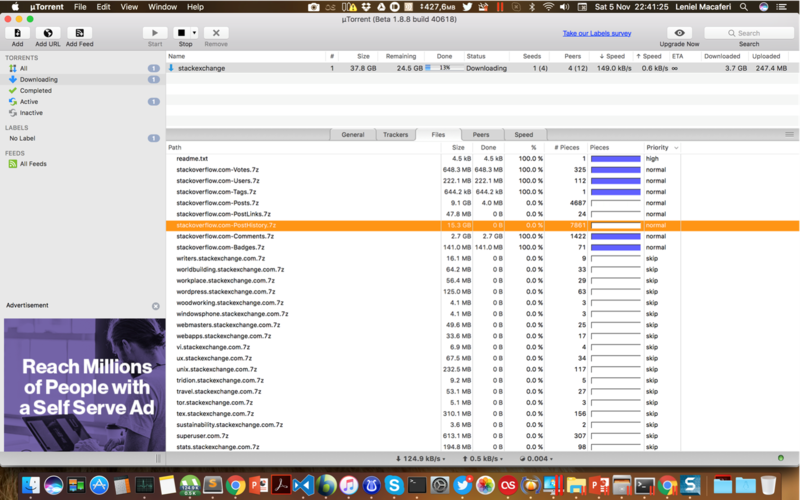 Even after compaction the biggest file has 15.3 GB. This size is directly linked to the data volume handled by Big Data. Spark at first will be used as an ETL tool (ETL = Extract > Transform > Load) to prepare the data consumed by a front-end web app. "At first" because there's also the possibility of using Spark as a tool to process the data that'll be shown in the web app. 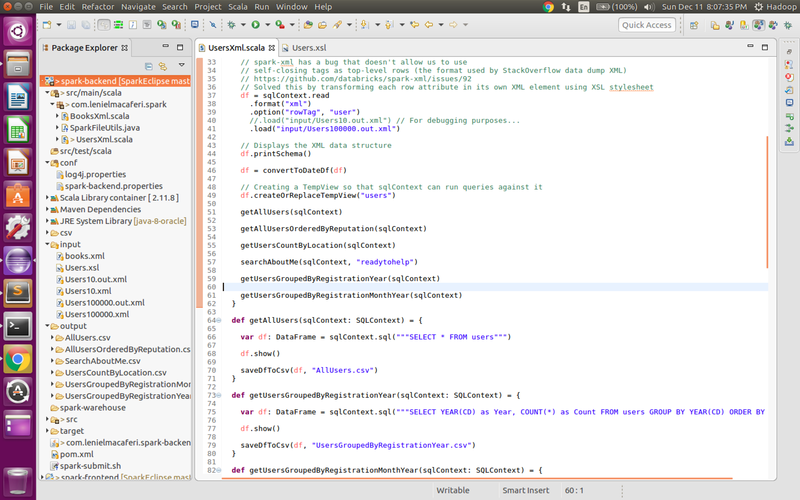 To make the work viable (running locally out of a cluster), a single .xml file [Users.xml] was used. A subset of 100.000 lines (32.7 MB) was selected. This file has a total of 5,987.287 lines (1.8 GB). The file Users.xsl was used covert Users100000.xml data to the format expected by spark-xml library. The result was saved to Users100000.out.xml. 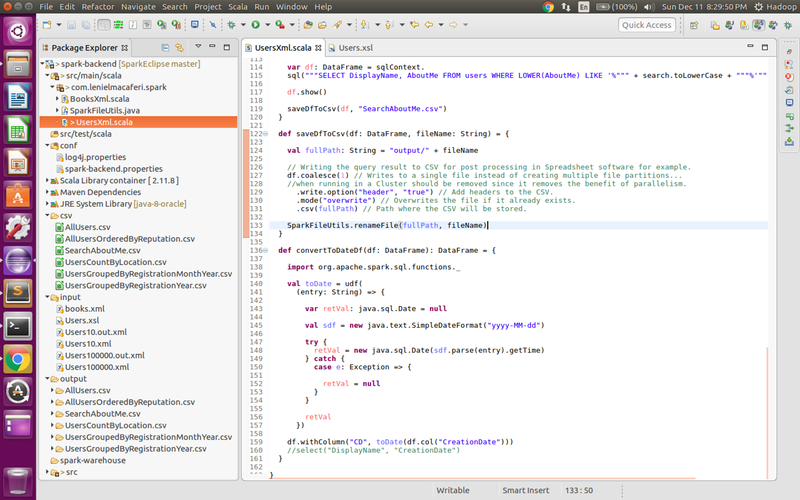 The .xml and .xsl files were placed into the input folder of the Scala project [spark-backend] inside Eclipse. 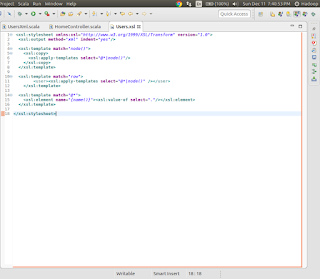 The application spark-backend read the file Users100000.out.xml through Spark XML and transforms it into a DataFrame object. The Spark SQL library is used subsequently to search the data. Some sample queries were created. 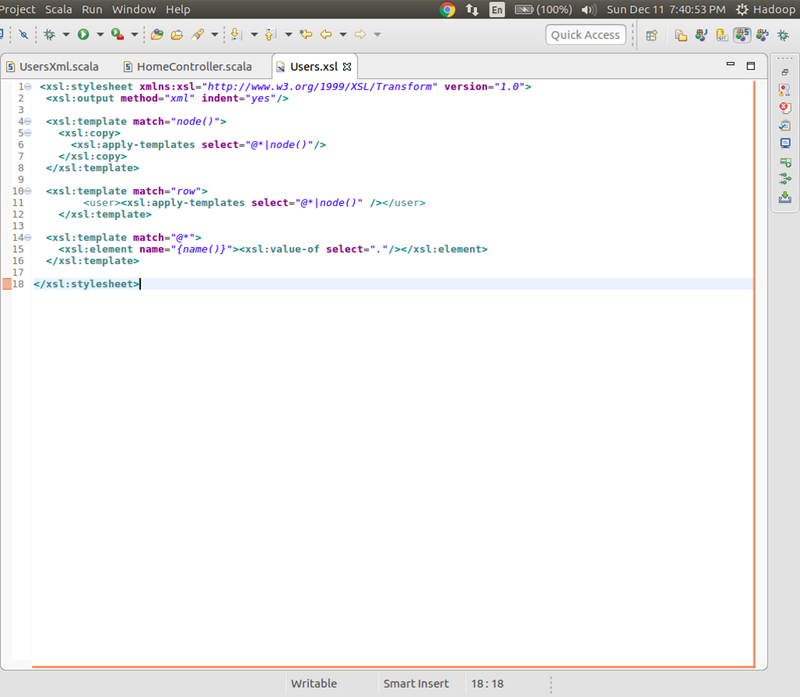 Each query generates a CSV file (SaveDfToCsv) to be consumed in a later stage by a web application [spark-frontend], that is, Spark is used as an ETL tool. The result of each query is saved in multiple files in the folder output. This happens because Spark was conceived to execute jobs in a cluster (multiple nodes\computers). For testing purposes, a method that renames the CSV file was created. This method copies the generated CSV to a folder called csv. 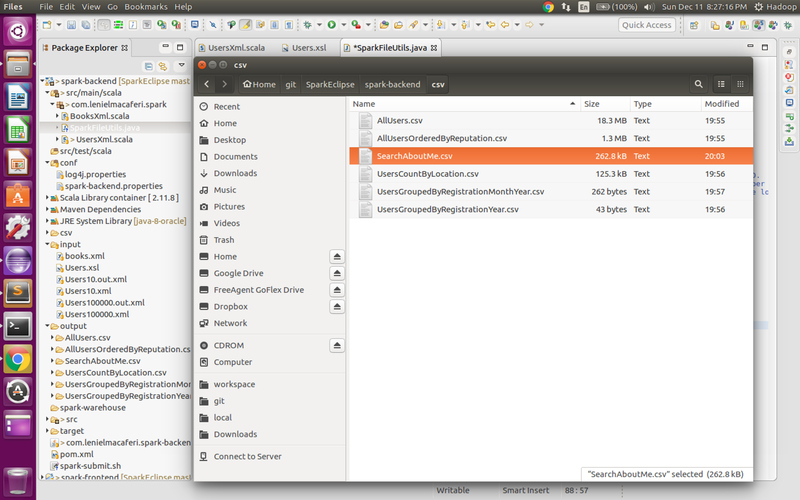 The destiny folder can be configured in the file conf/spark-backend.properties. 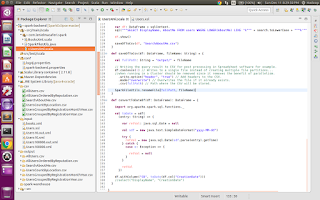 The application [spark-backend] can be executed inside Eclipse or through the command line in Terminal using the command spark-submit. 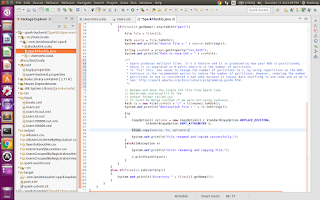 The application [spark-frontend] was built with Play Framework (The High Velocity Web Framework For Java and Scala). 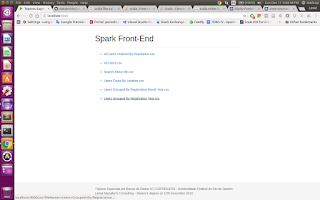 The user opens spark-frontend main page at localhost:9000 and has access to the list of CSV files generated by [spark-backend] application. 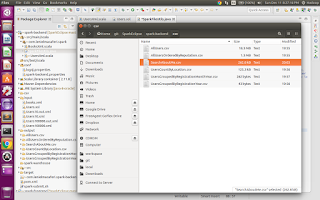 When clicking a file name, the CSV file is sent to the user's computer. The user can then use any spreadsheet software to open and post-process\analyse\massage the data. With Spark's help we can develop interesting solutions as for example: a daily job that can download and upload data to a folder "input" processing the data along the way in many different ways. Using custom made code we can work with the data in a cluster (fast processing) using a rich API full of methods and resources. In addition, we have at our disposal inumerous additional libraries\plugins developed by the developer community. 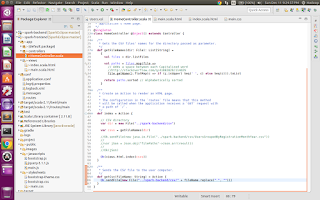 Put together all the power of Scala and Java and their accompanying libraries. 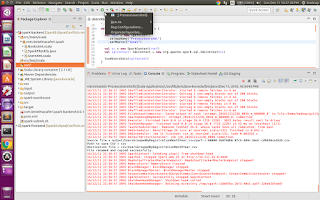 The application demonstrated can be easily executed in a cluster. 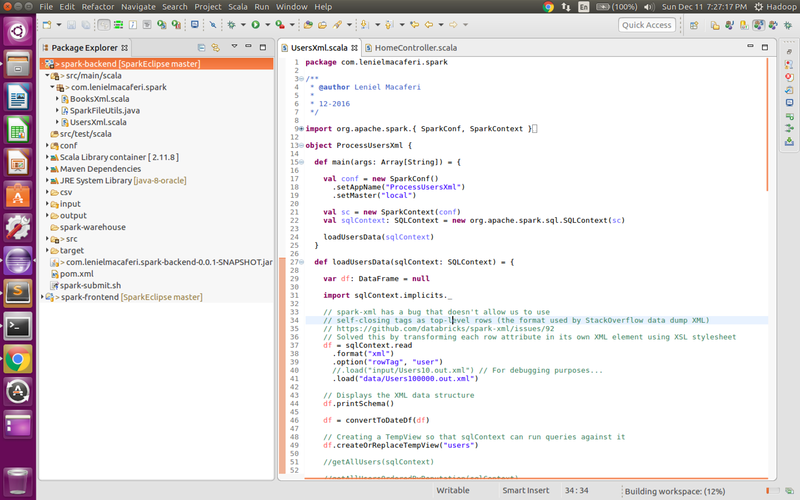 We only need to change some parameters in the object SparkConf. Today I needed to generate a BibTex file to serve as input to Parsif.al. Parsif.al is an online tool designed to support researchers to perform systematic literature reviews within the context of Software Engineering. 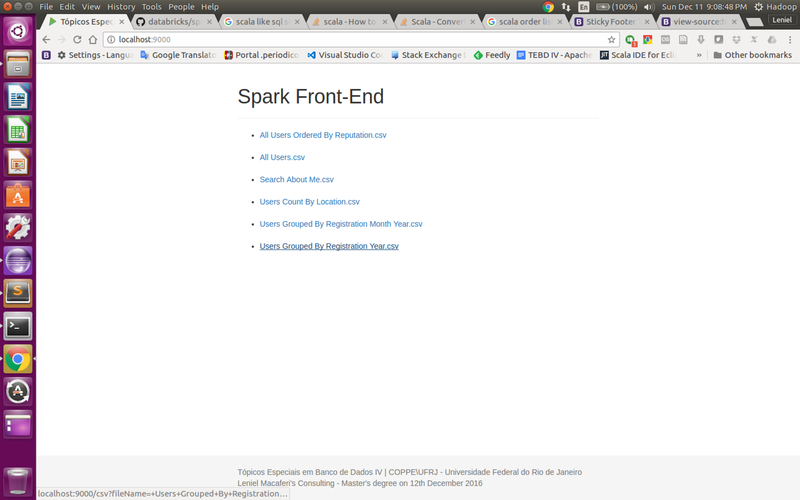 I hit a brickwall while doing a search in Springer Link because it only gives us a CSV file with the entire search result. It caps the result to the first 1000 registries. It'd be a pain to click and open each and every search result to be able to export the corresponding BibTex. 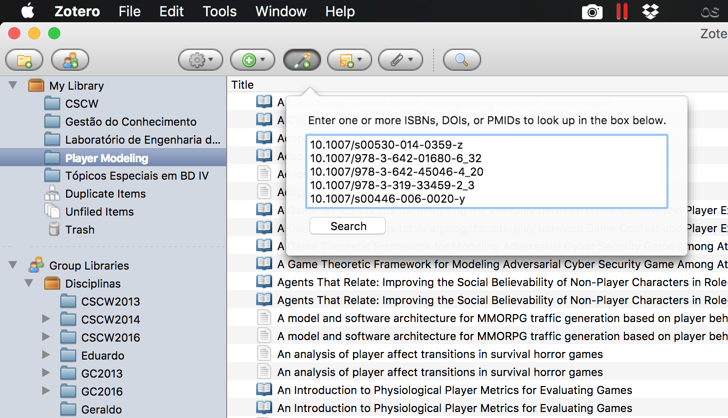 Using Zotero it's easy to get a BibTex out of the CSV file generated by Springer Link. 4 - Right click the folder and select Export collection... pick BibTex. First of all I like genealogy and I like history. I like Italy because part of my ancestors\antenati come from there. It's undeniable the affection I feel for the country. To know my origin is something that instigates my feelings and this post is my try to find relatives scattered all over the world. 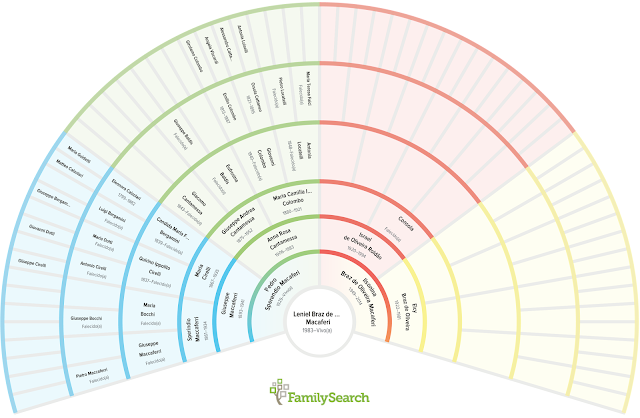 Below I tell my "recent" Italian family history in 3 idioms: Italiano, English and Portuguese. Il mio nome è Leniel Macaferi ed è nato il 06.10.1983 in Carangola, Minas Gerais, Brasile. Io sono di origine italiana. In linea paterna, io sono il nipote di una coppia di italiani: Giuseppe Maccaferri nato il 10.07.1893 a San Felice sul Panaro, Modena, Emilia-Romagna, Italia. & Anna Rosa Cantamessa nata il 23.07.1906 a Valtesse, Bergamo, Lombardia, Italia. Giuseppe Maccaferri [1893-1941] è arrivato in Brasile con 2 anni di età su 16.05.1896 a bordo della nave\vapore [Attività] con i suoi genitori Sperindio Maccaferri [1861 ~ 1935] e Maria Cirelli [1867 ~ 1935]. I miei bisnonni erano sposati a San Felice sul Panaro su 03.11.1887. Il mio cognome Macaferi è il modo "brasiliano" di Maccaferri. My name is Leniel Macaferi and I was born on 10.06.1983 in Carangola, Minas Gerais, Brazil. I am descendant of Italians. From the paternal line, I am the grandson of an Italian couple: Giuseppe Maccaferri born on 07.10.1893 in San Felice sul Panaro, Modena, Emilia-Romagna, Italy. & Anna Rosa Cantamessa born on 07.23.1906 in Valtesse, Bergamo, Lombardy, Italy. Giuseppe (Joseph) Maccaferri [1893-1941] arrived in Brazil at the age of 2 on 05.16.1896 aboard the ship [Attivitá] with his parents Sperindio Maccaferri [1861 ~ 1935] and Maria Cirelli [1867 ~ 1935]. My great-grandparents married in San Felice sul Panaro on 11.03.1887. Anna Rosa Cantamessa [1906-1983] arrived in Brazil at the age of 7 on 08.20.1913 aboard the ship [Regina Elena] with her parents Giuseppe Andrea Cantamessa [1875 - 1952] and Maria Camilla Irma Colombo [1880 ~ 1921]. My great-grandparents were married in Valtesse on 09.24.1901. My great-great-grandfather Giacomo Cantamessa (Giuseppe’s father) has arrived in Brazil on 12.16.1897 aboard the ship [Spagne] with his wife and the other children. Giuseppe was the one who stayed in Italy and emigrated to Brazil about 15 years later. My last name Macaferi is the "Brazilianized" way for Maccaferri. Meu sobrenome Macaferi é a forma “abrasileirada” de Maccaferri.